Who's that coming up the trail? Who's that jogging along with a lightweight custom backpack? Who's that whizzing by me in a blur of motion? OMG, it's Matt Kirk - holder of the men's record for fastest unsupported thru-hike of the Appalachian Trail! 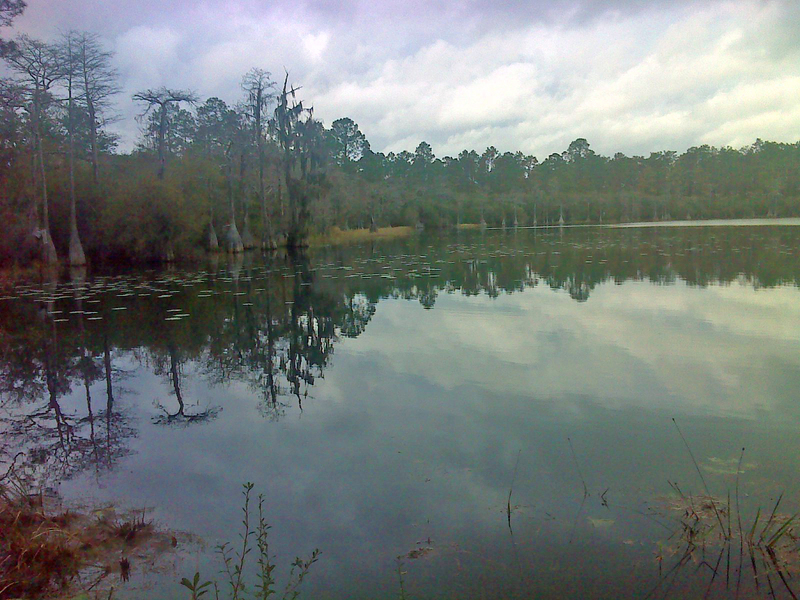 The Florida Trail is a quiet place. Sure, there are birds, babbling brooks, chattering squirrels, wind whispering in the pines, crickets, and all the usual sounds of nature. When I hiked through Bradwell Bay the other day there was enough wind to set some of the big old trees clattering against each other. It sounded like giants jousting - truly a startling sound. The quiet I'm talking about is the absence of the human element. The Florida Trail attracts only a dozen or so thru-hikers each year, and the majority of those hike northbound and don't start until after the first of the year. Southbounders coming down the trail during the hunting season are much more rare. But that's me - nonconformist from the word 'go'. The solitude is no problem. In fact it's one of the reasons I'm out here. If I want the human element I'll go to the city. Still, coming across another thru-hiker in our native element is always a treat. Thru hikers, by the very nature of that pursuit, share a strong passion that's not especially easy to verbalize, yet when two or more of them come together the conversation flows the way it might between old friends long separated. When I met AT thru-hiker Spinoza doing a four day section in Eglin back in late November we had that instant rapport. I figured that was a fluke and wouldn't happen again - at least not until I start bumping into the northbound 'bubble'. So imagine my shock when I meet another southbound thru hiker, and not just any thru-hiker, but a man I knew well by reputation, though I had never met him. In June 2013 Matt Kirk set out to break a record for fastest unsupported thru-hike of the Appalachian Trail. The record had stood for nearly a quarter century. When Matt arrived in Springer Mountain after 58 days, 9 hours, and 38 minutes, he had succeeded. And yes, it felt like meeting an old friend. I get star-struck easily, and Matt is a celebrity in hiking and running circles, but it never even occurred to me to be awed. It was just a pleasure to enjoy a bit of trail talk. He said he had seen my Trail Journals posts. I asked if he was trying to establish a speed record for the Florida Trail and he told me that there is already a recorded fastest time of thirty days, and he hoped to challenge it. He's out on winter break between college semesters, so he has three weeks - maybe stretching a few extra days if necessary - to make his attempt. The conversation wasn't long. We took each other's photos, I wished him success, and we were on our way. But because of my unique 'leap-frog' method of hiking the trail, we ran into each other two more times before my day was done, chatting some more each time. Matt had started around 4:30AM and would hike on into the evening. He's been doing fifty miles per day, and you don't do that in ten hours of winter daylight. I'll be following Matt's progress. He has a blog with an interactive map and is posting photos on Facebook. The non-human sights and sounds today were a mixed bag. The sound that dominated was the hum of mosquitoes. It was a warm humid cloudy day - seems to be their favorite weather. Stop for even five seconds and a buzzing gray cloud forms around you. There was also a brief heavy shower, but I had my trusty Go-Lite umbrella with me so I stayed perfectly dry. The good stuff included two kinds of good witch - a 'witches broom' growth that stood out in a forest of sameness. A witches broom is a genetic mutation, sort of like a cancer only not often deadly to the tree on which it forms. Plant collectors seek these and multiply them by grafting because their compact form makes excellent landscape plants. The other 'witch' was witch hazel in bloom - another first Florida species sighting for me of a plant that I forever associate with Hazeltop Mountain in Shenandoah National Park, VA - a magical place where my late Brother and I, along with nephew Rik, camped one June night. There were some great cypresses lining Bonnet Pond. For some reason I'm especially attracted to any tree that has a big bulky trunk - gives the impression of great age. Bonnet Pond was in the middle of a fresh burn area - still smoldering. As Matt said, it smells great, but it didn't suppress the mosquitoes. Neither of these carnivorous species is rare. Yellow Pitcher plants are abundant in the coastal NC wetlands I've hiked in, and the purple Pitcher Plant has the distinction of growing in near-tundra conditions in northern Canada as well as here in the Florida Panhandle. Today was a day I will long remember, not for nature's diversity, but for the un-sought human element. Thanks, Matt, and good luck going forward. update: Because of a badly swollen ankle that was preventing him from putting in the necessary miles to make a successful completion, compounded by a longing to be with friends and family for the holidays, Matt got off the trail at St. Marks. But Matt lives near the Florida Trail in Gainesville. I suspect he'll be back someday for another attempt at a sub-30 day Florida Trail thru-hike (that's the current fastest known time). Below is a map of the day's trek, with links to more photos. The Cathedral of Palms - I got religion! Lafayette Creek lets me through!